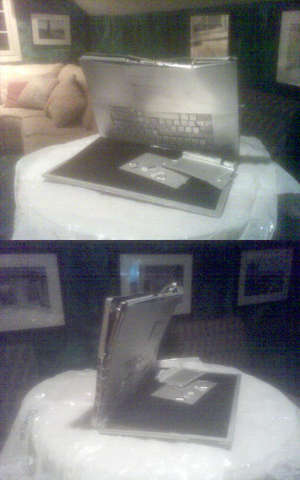 Ever wonder what it would look like if someone ran over their 17" PowerBook G4? It would look just like this. I wish my phone had a better camera, you can barely see it. But yeah, that is great. I tried to tear the hard drive out and see if maybe he got lucky and the data was still there, but the drive was knock-knock-knocking which means unless you are sending it to a data recovery lab, you're outta luck. Still though, what a great story to tell people! Customer as I'm walking out the door "be careful driving"
Me "I'll try not to run over any computers"